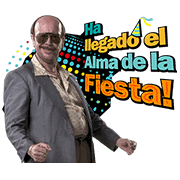 http://www.line-stickers.com/ – TORRENTE 5, Eurovegas Operation Line Sticker | Use of Torrente 5 stickers is illegal, all gang members are on file with Interpol and arrest warrants have been issued. (Torrente in some countries). Available till September 16, 2015. Copyright : TORRENTE 5. Copyright © AMIGUETES ENTERPRISES S.A.